The present work is the first island-wide soil study of Cs-137 contamination in Jamaica, and hence the first baseline data for Cs-137. A total of 68 surfical soil samples were randomly collected and measured with high resolution gamma-ray spectrometer, resulting in 61 samples showing activity levels above the limit of detection, for the artificial radioisotope fission product Cs-137. The range of measurable concentration of Cs-137 in Jamaican soil was 0.17 to 34.5 (Bq/kg) with a mean of 3.2± 0.6 Bq/kg. The 95 percentile of the distribution in the samples was 14.5 Bq/kg. The maximum activity concentration for Cs-137 was reported in the northern section of the Jamaica interior called the Alps at geographic location 18.3546o, -77.5096 o. The Inverse Distance Weighting (IDW) interpolation technique was used to provide a map showing the spatial distribution of the Cs-137 in Jamaica. The Spearman's non-parametric statistic was used to deduce the correlation among the spectroscopic and environmental. The analysis of the Cs-137 activity distribution showed an outlier of 34.5 Bq/kg in comparison to the population mean of 3.2 ± 0.6 Bq/kg. The absorbed dose rate in air 1m above ground due to primordial radionuclides revealed that the dose rate in some areas are above the world average of 60 nGy/h. The dose rate in Jamaica indicates a non-parametric distribution in the range from 9 to 278 nGy/h (with a mean of 75 ± 8 nGy/h). Recommendations regarding methods and equipment are suggested to improve the quality of the data presented in this study. Jamaica is surrounded by numerous nuclear power plants in its immediate vicinity as follows: USA (104), Canada (20), Mexico (92), and South America (4). Cs-137 is one of the traceable radionuclides produced in a nuclear accidents and weapons testing. It is very important from an environmental perspective to continually monitor this contaminant, as it allows the country to be able to quantify the impact of any nuclear accident occurring outside and within its border. Cs-137 is an artificial radionuclide with a half-life of 30.1 years, and its presence in the terrestrial environment is of great concern due to its deleterious effect on the human population and their food chain . It is created in the nuclear fission process with a relatively high fission yield of 6 atoms per 100 fission in comparison to 2.5E-11 per fission for Co-75 . 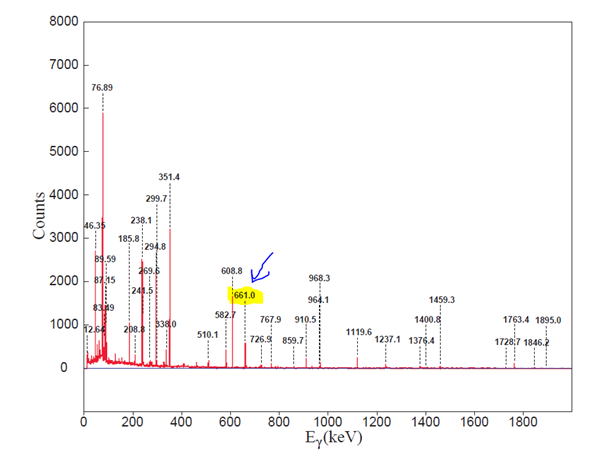 Cs-137 beta decays to the unstable Barium-137m with half-life of 2.52 minutes; Ba-137m decays to a stable isotope by emitting a 661.66 keV gamma ray, an easily detectable photopeak in gamma spectroscopy. The major presence of Cs-137 in the terrestrial environment may be traceable to a number of sources including nuclear weapons testing during the period 1958-1963 , a minor period of deposition from 1971 to 1974  and the Chernobyl nuclear power plant disasters in 1986 and the Fukushima accident in 2011 . Following these incidences, numerous studies have been done in various countries to quantify the impact of Cs-137 on the ecology especially its impact in milk [6-8] and general agricultural product [9-16]. In Jamaica, studies on the impact of Cs-137 in cow’s milk due to low potassium soil content, can date back to the 1960s [17, 18] and 1970s , where in the latter study the Cs-137 content in the milk was found 10 to 100 times the levels found on farms with normal potassium levels. The global Cs-137 fallout is dependent on latitude and precipitation [5, 20]. The northern hemisphere has a greater concentration level than the southern hemisphere, with a maximum reported at 45 N, and a minimum at the equator . Various studies have indicated that the variation of Cs-137 concentration in the soil environment varies up to factors of tens, even in a small area with surface soils from undisturbed areas producing the greatest variability. In the north eastern USA, surface sample geometric mean concentrations were in the range from 10 to 110 Bq/kg with the 95th percentile concentrations extending to about 700 Bq/kg . The wide variability of Cs-137 in soils complicates its use in erosion studies in soils . Nevertheless, the fallout from Cs-137 has been used to study rates and patterns of soil redistribution. This method requires knowledge about the initial fallout of Cs-137 in the study area . Cs-137 is carried to the surface of soils by various mechanisms including direct deposition (wet and dry) from the atmosphere, wash-off from vegetation, and deposition from water on floodplains and regions along the coast . The Cs-137 concentration in soils has been shown to be highest in the uppermost layers of the soil (accounting for 78 percent in the 0-3 cm range) and decreases rapidly with depth showing no detectable concentration beyond 20 cm . Specifically, the fall off with depth has been shown to be exponential with the smallest aggregate-size soil (<0.063 mm) giving the highest concentration of Cs-137 . A recommended model for describing the migration pattern of Cs-137 in soils is the convection-diffusion model shown in equation 1 . Given an initial condition (the deposition density in Bq/cm2), the function describing the vertical distribution of Cs-137 is given by equation 1 where “c” is the Cs-137 concentration in Bq/kg from a given source “t” years after the initial condition occurred, “D” is the effective diffusion coefficient in cm2/y, “x” is the depth , “ρ” is bulk density in g/cm3. and “v” is the effective migration velocity in cm/y. An application of this model has been described . A study of the distribution of Cs-137 in Japanese forest soils found that the average activity concentration of 16 samples around a tree was 42.4 Bq/kg and a standard deviation of 25.9 Bq/kg. This finding indicates the importance in the selection of sampling sites and the number of samples from the surface soils especially around trees . Szabo et al showed that about 78% of the total detected Cs-137 concentration was measured in the top 3 cm portion of soil profile with no detectable concentration below 20 cm . The soil 0-10 cm depth used in this study is therefore practical for good results. A previous study of the surficial soil environment in Jamaica (Table 1) showed the following results for the primordial radionuclides . 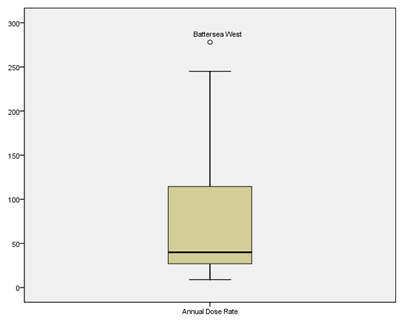 These results are a summary of the data used to generate the map of the annual dose rate 1m above ground. The goal of this study is to analyse the radioactivity and health implications of the soil-based environment in Jamaica due to the presence of the primordial radionuclides (Uranium-238, Thorium-232, and Potassium-40) and the artificial radionuclide Ceasium-137. The study will examine the correlation between Cs-137 activity concentration with the soil characteristics such as soil type, pH, organic matter, geology, location, and soil texture. We will propose remedial efforts where necessary, to combat these challenges. The results of this study will serve as the first available baseline data of Cs-137 concentrations in Jamaica. Using this study, impact assessment studies can be done in the event of a nuclear accident, especially due to the proximity of Jamaica to north America where approximately 19 operable nuclear power plants exist in Canada and 99 in the United States . In 2011, a random sampling technique divided Jamaica into 50 square grids with a maximum sampling density of 225 square meters per sample. The 68 soil samples collected were restricted to a depth of 0-10 cm after all living vegetation was removed. The pH, soil texture, geology, organic matter constituent, and primordial gamma-ray activity concentration of the sampling points were also examined. The collected soils samples were sieved using a 2-mm sieve, dried at 60 degrees Celsius for approximately 18 hours and stored in a sealed cylindrical container in a cool dark area. This plastic container was of radius of 34.5 mm, side thickness of 2 mm, and height of 21 mm. The detector used in this experiment was a Canberra 3825 HPGe detector with absolute efficiency = 27.61%, and measured efficiency = 28.15%. This detector has an active area of 38 cm2 and active diameter of 71 mm and was cryogenically cooled by liquid nitrogen in a vertical dipstick type 7500SL 30 litre Dewar throughout the measurement process. The detector and samples (in the plastic container) were enclosed in a 950-kg Model 747E, 10 cm thick lead shield with graded 1 mm tin and 1.6 mm copper liner to reduce interference by lead x-rays, cosmic and background radiation during the counting, and improve the lower limit of detection. The floor of the shield had a 12.1 cm diameter hole to facilitate the cryostat and the shield itself had a 9.5 mm thick low carbon steel . Soil and background samples were counted in lead enclosure for approximately 24 hours using the Genie 2000 software for spectrum acquisition . The calibration (energy and efficiency) for this detector was done using the Monte Carlo method inherent in Canberra’s LabSOCS (Laboratory Sourceless Object Counting System). Canberra describes the LabSOCS measurement process as including the following: (a) characterizing the detector at the factory, (b) acquiring spectral data from the sample, (c) specifying the dimensions and physical composition of the measured object in the Geometry Composer model, (d) generating an efficiency calibration file appropriate for the specified counting configuration and (e) using these efficiency results to analyze the acquired spectra . For each soil sample measured, an efficiency curve was generated to ensure that individual features such as soil density was taken into consideration. Gamma-ray photopeaks at 661.66 keV were analyzed to determine the specific activities for Cs-137. The spectroscopy data for each sample were entered in a typical spreadsheet for further analysis. SPECTRW software was used for gamma-ray analysis of the spectrum for each sample . The Inverse Distance Weighting (IDW) interpolation technique in ArcGIS software was used to develop a map showing the distribution of the Cs-137 in Jamaica. The statistical software SPSS version 22.0 and GraphPad Prism version 6.00 for Windows were used to perform the statistical analysis reported in this paper. The Spearman's non-parametric statistic was used to deduce the correlation among the variables investigated in this report since the D’Agostino and Pearson Omnibus Normality tests indicated that the environmental variables under investigation were from a non-Gaussian distribution. Environmental variables are generally lognormal in distribution . 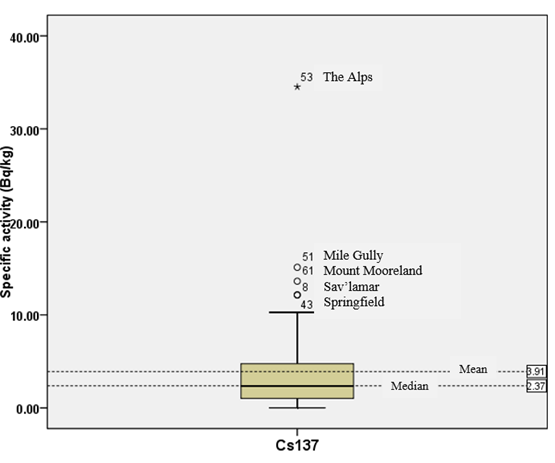 The maximum activity concentration of Cs-137 was observed in the Alps region of Jamaica. The spectrum is given in Figure 1 depicting the gamma-ray energy lines of natural radioactivity as well as the Cs-137 contribution at 661.66 keV. Figure 1: Soil sample spectrum together with a background spectrum counted for 24 hours on the HPGe detector. The highlights and arrow shows the 661.6 keV energy line for Cs-137. In SPECTRW, the samples are associated with an uncertainty from which the mean activities are reported. The uncertainty budget corresponds to the statistical uncertainty from the net area calculation (4-10%), the efficiency (4 %) and the mass of the sample (0.1%). The nuclear analysis technique employed two efficiency curves for the cylindrical container in contact with the face of the Canberra 3825 HPGe detector, shown in Equation 2. The resulting equations below (for the range before and after 100 keV, respectively) increases the accuracy of the spectrometry results. Details on the nuclear analytical technique, sample collection, spectrometry, minimum detectable limits, and quality assurance methods used in this study have been published . Genie 2000 Nuclide MDA (Minimum Detectable Activity) report was run to generate the minimum detectable activity for the radionuclides under investigation in this study. The efficiency of Cs-137 (661.66 keV) for the cylindrical geometry used in this study was 0.023890 (4%) as estimated by the Monte Carlo simulation providing a Minimum Detectable Activity (MDA) of 0.851 Bq/kg. The location, the coordinates of the samples sampling sites and the results of the activity concentration (including the uncertainties as explained above) are given in the Table 2. In Figure 2, the results of the spatial distribution of Cs-137 activity concentration in Jamaica is shown. Seven (7) of the samples exhibited very low activity concentration values and were not used in the interpolation process. The results from the gamma-ray spectrometric analysis of the remaining 61 samples were used for the producing the map. The range of measurable activity concentration (Bq/kg) of Cs-137 in Jamaican soil was 0.2 to 34.5 with a mean of 3.2 ± 0.6 Bq/kg. The 95-percentile of the distribution in the Jamaican samples was 14.5 Bq/kg, indicating that only 5% of the sample had an activity concentration above 14.5 B/kg. The maximum value for Cs-137 activity concentration (34.5 Bq/kg) was reported in the northern section of the Jamaica interior called the Alps at location 18.3546 o, -77.5096 o. The detection efficiency of Cs-137 (661 keV) for the cylindrical extended geometry used in this study was 0.023890 (4%) as deduced by the Monte Carlo simulation with a Minimum Detectable Activity (MDA) of 0.85 Bq/kg. The study indicates that soil-resident Cs-137 is distributed fairly evenly island wide. The MDA calculation of the method is given elsewhere . Observation of the Normal Q-Q plot of expected - normal versus observed value plot indicated that the distribution of Cs-137 in the Jamaican environment was lognormal in distribution. The average of the Cs-137 activity concentration in Jamaican soil was compared with published results and summarized in Table 3. The statistical outliers from the Box-and-Whisker plots (shown in figure 3) were analysed to improve our understanding of Cs-137 in the Jamaican terrestrial environment. These outliers were located as follows; Mile Gully (18.128 o, -77.542 o), Mount Mooreland (18.068 o, -76.934 o), Savannah-La-Mar (18.261 o, -78.136 o), Springfield (18.288 o, -78.295 o), and the Alps (18.355 o, -77.509 o). The outliers were placed in a separate category and compared with the entire population (Table 3). A possible explanation for the presence of these outliers may be the unexamined presence of illite and kaolinite clay minerals which, along with other soil components, are known to be major sorbers of Cs-137 . The results of the Spearman’s correlation analysis for Cs-137 versus geochemical parameters are shown in Table 4. The correlation values for Cs-137 with organic matter (0.422) was expected to be negative based on published results which suggested an inverse relationship between the two environmental variables . It has been shown that the absorption characteristics of the soil for Cs-137 is enhanced by low organic matter (< 40% by mass) which improves the fixation process. At higher levels of organic matter, the clay minerals content is not sufficient and the migration of Cs-137 is higher . In this study, the organic matter content in all measured samples accounts for less than 40 percent, with the 95 percentile of the sample distribution being 27.2 percent. The general homogeneity of low organic matter in the Jamaican soil samples may be a causative factor for this result. This unexpected positive correlation result may also be due to the presence of elevated levels of Ra-226 in the Jamaican soil which moderately correlated with Cs-137 (0.632). This finding suggests that in soils with elevated levels of uranium, such as Jamaica , the impact of U-238 daughter products has a greater impact on Cs-137 retention than the organic matter characteristics of the soil. A published survey of soils in Jamaica, indicated that U-238 also correlated with aluminium (0.72), chromium (0.71), iron (0.61) and the rare earth elements (0.60 – 0.76) . This implied that one or more of these elements may contribute to the Cs-137 retention in soil. Similarly, the soil pH had a weak negative correlation of -0.245 with Cs-137. The ArcGIS 10.1 analysis of the spatial pH distribution data in Jamaica, retrieved from the GIS shape files provided by the Rural and Physical Planning Agency in Jamaica, indicates that 49 percent of the island’s soil is characterized as alkaline, 7 percent as neutral, and 16 percent as slightly acidic: this also implies the level of homogeneity in the pH environment. Cs-137 is readily absorbed by the clay minerals in soils with the adsorption being predominantly a chemical process occurring in an ion-exchange mechanism [18-20]. The presence of Cs-137 in soil is complicated by other factors such as soil type and its chemical properties, soil depth, climatic conditions of the area such as rainfall, temperature, and humidity and the presence of microorganisms in the soil, and the drainage characteristics of the area [15, 16, 20]. The correlation value between Cs-137 and K-40 (-0.413) suggested an inverse proportionality in soil, a relationship that is observed in other studies [39, 40]. This negative value is based on the inverse relationship between both radionuclides in soils that are potassium deficient [17, 18], such as Jamaica soils . The low correlation with geology (0.263) is expected since the Cs-137 contaminant originated externally to the environment. Increase in sampling density is expected to report a lower value or no correlation at all. Figure. 4: Diagram of the absorbed dose rate in air 1m above ground. Unit nGy/h. The absorbed dose rate in air 1m above ground, D, due to the presence of soil resident primordial radionuclides ,was calculated using the expression in equation 3 . Where Au, ATh, and AK40 refers to the activity concentration of uranium, thorium, and potassium respectively. The distribution of the absorbed dose rate 1m above ground (see Figure 4), highlights the areas above the world average of 60 nGy/h  . The rational for the higher levels is due to the elevated areas of U-238 and Th-232 due to the bauxite soil types in the central portion of the island . The results of the absorbed dose rate 1m above ground in Jamaica indicate a non-parametric distribution in the range 9 to 278 nGy/h with a mean of 75 ± 8 nGy/h and a standard deviation of 66 nGy/h (Figure 5). The One-Sample T-Test results [t(64) = 1.842, p=0.070] indicated that the sample’s mean value was however not statistically significantly higher than the world mean value of 60 nGy/h. The Pearson’s correlation of the absorbed dose rate 1m above ground showed a negative correlation with K-40 (-0.54) and a positive correlation with Cs-137 (+0.55). Figure 5: Diagram for the distribution of the absorbed dose rate in air, 1m above ground in Jamaica. The paper studied the activity concentrations of the radionuclide Cs-137 and the gamma absorbed dose rates of the three primordial radionuclides (U-238 and Th-232 series and K-40) in the soil samples collected across Jamaica. The results are presented in a statistical manner and can be of importance as baseline data in determining the national background radiation levels and evaluating health hazards. In addition, the study will add value to the global environmental radioactivity studies. The analysis of Cs-137 concentration in Jamaican soil (0.17 to 34.5 Bq/kg, mean of 3.2± 0.6 Bq/kg., and 95 percentile distribution value of 14.5 Bq/kg), suggest a distribution of activity concentration that may not have a significant health impact. In comparison to select areas (North America, Europe and Asia), this value is relatively low. 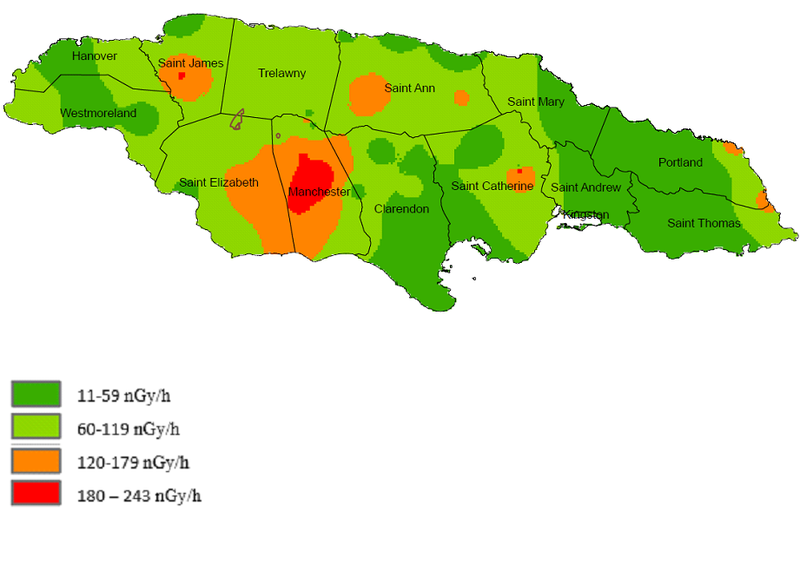 The map showing the spatial distribution of the Cs-137 activity concentration, suggest that this low level of activity is evenly distributed across Jamaica and may be used as baseline data in the event of a nuclear accident in the USA. The absorbed dose rates in air 1m above ground suggest that most of the areas with values above the world average of 60 nGy/h were in the middle of the island where lands are used in bauxite production. A study by Miller & Voutckov concluded that the major contribution to these radiation levels are the elevated activity concentration of thorium and uranium in the Jamaica bauxitic soils. It is difficult to correlate incidences of cancers amongst the population living in these areas due to long traditional pattern of migration from the rural areas to specifically the capital town, Kingston. The distribution of elevated levels of the dose rate 1m above ground across the island, suggest that additional studies are needed to assess any health implication to the population residing in these areas. The correlation analysis showed that Cs-137 activity concentration values were independent of the physical environmental factors investigated in this study. The results of this study should be considered as an initial assessment in the establishment of a baseline Cs-137 contamination study of the Jamaican soil environment. Additional study with a sampling method customized to Cs-137 activity concentration with increased sampling density is required to improve the quality of the contamination map. Additional modelling mechanism such as a Lagrangian particle dispersion model should be adopted for analysing the impact of fallout radionuclides from the nuclear power plants near Jamaica . Additional X-ray diffraction analysis (XRD) is being suggested to examine the mineralogical composition of the Cs-137 outliers in this study and to specifically determine the levels of illite and kaolinite clay minerals which, along with other soil components, are known to be major sorbers of Cs-137. The X-ray mineral database is suggested to identify the major mineral phases in the samples . The authors acknowledge the collaborative efforts of the University of the West Indies (Jamaica) and the Hellenic Centre for Marine Research (Greece). We also acknowledge the work of the International Atomic Energy Agency (IAEA) in outfitting the Neutron Laboratory at the University of the West Indies. Yasunari TJ, Stohl A, Hayano RS, Burkhart JF, Eckhardt S, and Yasunari T (2011) Cesium-137 Deposition and Contamination of Japanese Soils due to the Fukushima Nuclear Accident. Proceedings of the National Academy of Sciences. Ritchie JC,McHenry JR (1990) Application of Radioactive Fallout Cesium-137 for Measuring Soil Erosion and Sediment Accumulation Rates and Patterns: A Review. Journal of Environmental Quality 19: 215-233. Tauchnitz M, Degering D, Pretzschner C, Wonik T, and Boess J, Monitoring of Natural Radionuclides in Soils as a tool for precision farming - methodical aspects, in Uranium in the Environment. B. Merkel and A. Hasche-Berger, Editors. 2006, Springer Berlin Heidelberg. p. 69-77. Menzel RG (1964) Competitive uptake by Plants of Potassium, Rubidium, Cesium,Calcium,Strontium and Barium from Soils. Soil Science 77. Nishita H, Romney EM, and Larson KH (1961) Uptake of Radioactive Fission Products by Crops Plant. Journal of Agricultural Food Chemistry 9. Broesus RW, Cesium-137/Strontium-90 ratios in Milk and Grass from Jamaica, 1970, New York University: New York. Stach A, Possibility and Limitations to use Cesium-137 to study Soil Erosion in Poland, J. A., Editor 1996, Ochrona agroekosystemów zagro¿onych erozj: Poland. p. 203-226. Davis JJ, Cesium and its Relationship to Potassium in Ecology, in Radioecology. 1963, Reinhold: New York. p. 539-556. Wallo III, M. Moscovitch, J.E. Rodgers, D. Duffey, and Soares C, Investigations of natural variations of Casesium-137 concentrations in Residential Soils, in The Health Physics Society 39th Annual Meeting1994: USA. Poręba G, Bluszcz A, and Oenieszko Z (2003) Concentration and Vertical Distribution of Cs-137 in Agricultural and Undisturbed Soils from Chechlo and Czarnocin areas. Journal on Methods and Applications of Absolute Chronology 22: 67-72. Poręba G,Bluszcz A, Determination of the Initial 137Cs Fallout on the Areas Contaminated by Chernobyl Fallout, in Geochronometria2007. p. 35. Bossew P,Kirchner G (2004) Modelling the Vertical distribution of Radionuclides in Soil. Part 1: The Convectionedispersion equation revisited. Journal of Enviromental. Radiactivity 73: 127e150. Association WN (2018) Nuclear Power in the World Today. Canberra Canberra Germanium Detectors (2013). Kalfas CA, Axiotis M, and Tsabaris C (2016) SPECTRW: A software package for nuclear and atomic spectroscopy. Nuclear Instruments and Methods in Physics Research Section A: Accelerators, Spectrometers, Detectors and Associated Equipment 830: 265-274. K. Vosniakos F. CS-137 and K-40 Concentration In Soil and their transfer to Plants. in Third International Scientific Symposium "Agrosym Jahorina 2012". 2012. Serbia. Yasunaria TJ, Andreas Stohlb, Ryugo S. Hayanoc, John F. Burkhartb, Sabine Eckhardtb, and Yasunarie T (2011) Cesium-137 Deposition and Contamination of Japanese Soils due to the Fukushima Nuclear Accident. Proceedings of the National Academy of Sciences 110. Tamura T (1964) Selective Sorption Reaction of Cesium with Mineral Soils. Nuclear Safety 5: 262-268. Smolders E, Van den Brande K, and Merckx R (1997) Concentrations of 137Cs and K in Soil Solution Predict the Plant Availability of 137Cs in Soils. Environmental Science & Technology 31: 3432-3438. Isinkaye MO (2008) Radiometric assessment of natural radioactivity levels of bituminous soil in Agbabu, southwest Nigeria. Radiation Measurements 43: 125-128. Miller M,Voutchkov M (2014) Evaluation of gamma activities of naturally occurring radioactive materials in uncontaminated surface soils of Jamaica. Journal of Radioanalytical and Nuclear Chemistry: 1-11.